You’ve no doubt heard that the bulk of your property’s value lies in its land and therefore a house is a better investment than an apartment. Well, this is a very general statement so this doesn’t mean houses are always the best investment, or that apartments are not capable of delivering substantial profits. Let’s look at three other common porky pies you’ll hear about property investing. The “Australian property market” is made up of so many different states and market conditions, which makes it an ever-changing beast. Even to look at the Perth property market; within each suburb there are varying factors related to location that can impact a property’s value. A house on the water with uninterrupted ocean views, in a street full of multi-million dollar homes? Obviously, that’s going to be worth more than a house of the same size, age and quality that is located three streets away in an unkempt cul-de-sac, where the only views are of housing commission flats. Fact: There is no such thing as ‘one’ property market. Each state has multiple markets created by different geographic locations, different price points and different types of property. You’ll often hear people say that properties double in value every 7 to 10 years. Unfortunately, that’s simply not true. While some may have doubled, countless others haven’t performed so well. Fact: Not all property is created equal and you can’t just buy any property and hope it will make a good investment and substantially rise in value. The secret is finding an “investment grade” property that will outperform the averages. You’ve probably seen the ‘property clock’ which depicts the cyclical nature of the property market with midnight representing the peak of the ‘hot market’, and 6 o’clock representing the bottom of the cycle. At a very simplistic level, it makes sense to buy at the bottom of the market, but that’s not the only factor that matters and the bottom is only one day which none of the experts can pick till the market has moved on. Sure buying at the bottom of the cycle may mean that you score a bargain – but if that market stays in the doldrums for several years (or longer), then what have you really achieved? But according to conventional wisdom, buyers should have stay away once the market started rising (having missed the bottom), however if you had listened to this advice, you would have missed out on substantial profits. Fact: Buying near the bottom of the cycle may seem like a great idea – it’s what some people call “hot spotting.” Also known as speculating! You make your money when you buy your property, not because you bought it cheaply, but because you bought the right property – one that will be in continuous strong demand by a wide range of owner occupiers who can afford to and be prepared to pay to live there. 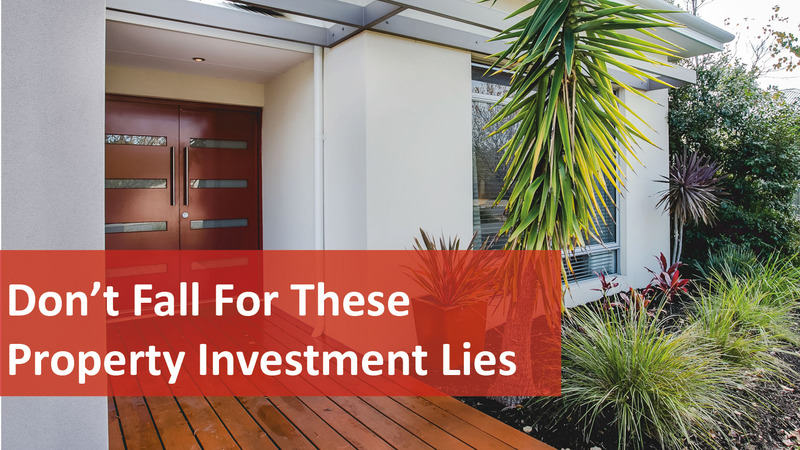 Of course these are just some of the many common “lies” being perpetrated about property – there are dozens more to be wary of. If you have any questions regarding owning an investment property, call our friendly and knowledgeable team on 08 6254 6300, today!